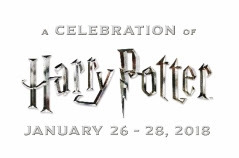 Orlando, Fla. (November 20, 2017) – Today, Universal Orlando Resort and Warner Bros. revealed more details about A Celebration of Harry Potter – the three-day fan event that will feature exciting experiences from across the Wizarding World onJanuary 26-28, 2018. Returning for their fifth appearance, Miraphora Mina and Eduardo Lima will bring London’s House of MinaLima to Orlando, showcasing the graphic designs of Weasleys’ Wizard Wheezes. Over the last 17 years, MinaLima have created the graphic universe of J.K. Rowling’s Wizarding World from the Harry Potter and Fantastic Beasts and Where to Find Them films to The Wizarding World of Harry Potter – Diagon Alley at Universal Orlando Resort, as well as a series of bestselling books.